The Hubble Space Telescope has "caught" the Boomerang Nebula in these new images taken with the Advanced Camera for Surveys. This reflecting cloud of dust and gas has two nearly symmetric lobes (or cones) of matter that are being ejected from a central star. Over the last 1,500 years, nearly one and a half times the mass of our Sun has been lost by the central star of the Boomerang Nebula in an ejection process known as a bipolar outflow. The nebula's name is derived from its symmetric structure as seen from ground-based telescopes. Hubble's sharp view is able to resolve patterns and ripples in the nebula very close to the central star that are not visible from the ground. Bipolar outflows are seen to occur both from very young stars ("protostars") that are still in the process of collapsing and forming, and from old stars nearing the ends of their lives that have become bloated red giants. The Boomerang is believed to be the ejected outer layers from an old red giant. 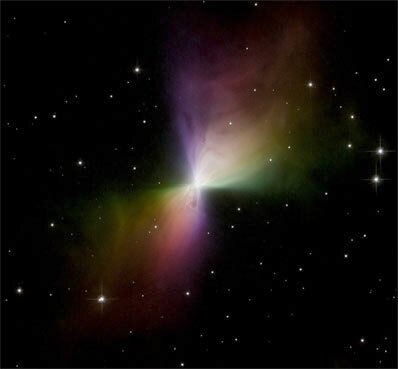 Each lobe of the Boomerang Nebula is nearly one light-year in length, making the total length of the nebula half as long as the distance from our Sun to our nearest neighbors -- the Alpha Centauri stellar system, located roughly 4 light-years away. These images of the Boomerang were taken in early 2005 with the Advanced Camera for Surveys onboard Hubble. A visible light filter was used in combination with a series of polarization filters. Similar to polarizing sunglasses that are used to reduce the amount of scattered light that enters our eyes on a sunny day, the telescope's polarizing filters allow only light of a specific polarization angle to pass through to the camera's detector. By combining images taken at different polarization angles, astronomers can study light scattering in the nebula and the properties of the small dust particles responsible for the scattering. Colors were assigned to represent different polarization components, and then those colors were adjusted to accentuate features in the nebula, resulting in the multi-hued composite image.